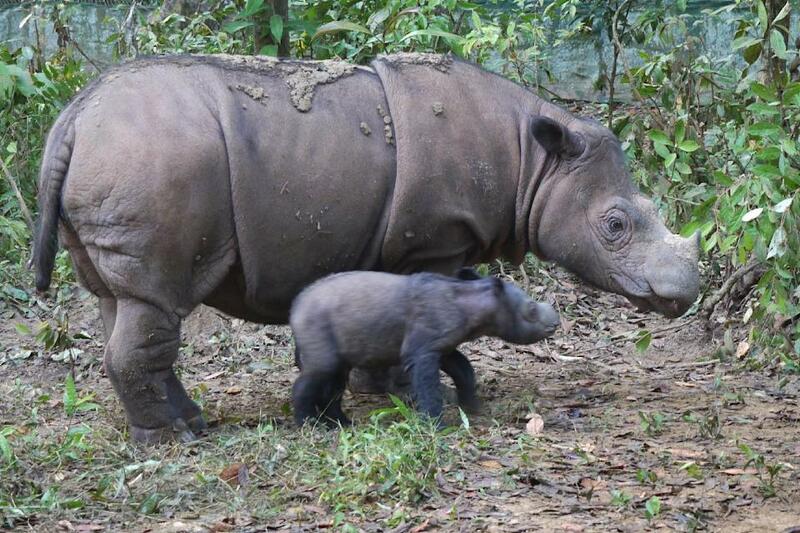 Miami (AFP) – A rare Sumatran rhino in Indonesia is pregnant with her second baby and expected to give birth in May, raising new hope for the critically endangered species, conservationists said Tuesday. Only about 100 Sumatran rhinos are believed to exist in the entire world so the pregnancy is seen as tremendously good news for those trying to save the animals from extinction. The mother is Ratu, a wild rhino who wandered out of the rainforest and into the Sumatran Rhino Sanctuary in Indonesia’s Way Kambas National Park 10 years ago. She got pregnant in January after mating with Andalas, a male rhino at the park, said Susie Ellis, director of the International Rhino Foundation. Sumatran rhinos have very long pregnancies that last about 16 months, even though they are the smallest of the living rhino species. “We just wanted to be sure it would take before we made an announcement because in early pregnancy any number of things can go wrong,” Ellis told AFP. Ratu’s pregnancy was announced on World Rhino Day, which aims to raise awareness about the five remaining species of rhinos. Sumatran rhinos are the only Asian rhinoceroses with two horns. They are covered in woolly hair that ranges from reddish brown to black in color. While Javan rhinos are considered the world’s rarest rhinos, Sumatran rhinos are under increasing threat by poachers and continue to lose precious forest habitat. “One more rhino means one percent more animals. That is not a lot but it is certainly an upward trend,” Ellis said. Conservationists have been working on a new plan to save the Sumatran rhino, after the animals were recently declared extinct in Malaysia. Wildlife experts say the rhinos need more intensive protection from poachers, and isolated animals should be moved into areas where other rhinos live, a complicated and costly endeavor that may involve airlifting the lumbering creatures by helicopter. Ellis said plans are under way to raise money to expand the Sumatran Rhino Sanctuary, built with foundation funds in 1996 and managed in cooperation with the Indonesian government and the Rhino Foundation of Indonesia. That way, “other animals that are found out in the forest that are reproductively viable can be brought there to be part of the managed breeding program,” Ellis said. 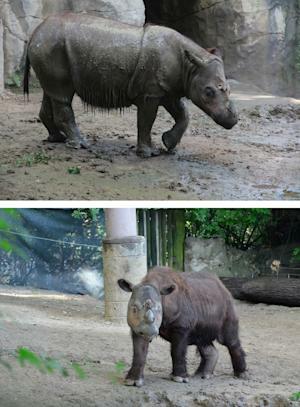 Births of Sumatran rhinos in captivity are rare. Just four Sumatran rhinos have been born at breeding facilities, including the Sumatran Rhino Sanctuary and Cincinnati Zoo. Ratu’s first baby, Andatu, was born at the Sumatran Rhino Sanctuary in 2012, marking “the first Sumatran rhino born in an Asian breeding facility in more than 140 years,” said a statement by Siti Urbana Bakar, the Indonesian Minister of Environment and Forestry. The current pregnancy “represents nearly two decades of international collaboration to save the species,” he added. Andalas, the father of both Andatu and the expected calf, was born at Cincinnati Zoo. He was moved to Indonesia from Los Angeles Zoo in 2007. The only remaining Sumatran rhino in the United States is Harapan, Andalas’ younger brother. He will be moved from Cincinnati Zoo to Indonesia later this year in an effort to boost the breeding population at the rhino sanctuary, which is currently home to five Sumatran rhinos. Terri Roth, vice president of conservation at Cincinnati Zoo, said it is difficult to say goodbye, but it is the right thing to do for the rhino population. “It is hard on the staff and there are a lot of people here in Cincinnati who have fallen in love” with Harapan and the other rhinos that used to live at the zoo, she told AFP. Harapan’s sister, Suci, died last year of an inherited disease, leaving him alone at the zoo. As for Ratu, she has months to wait before giving birth to a calf that will likely weigh 50-60 pounds (23-27 kilograms).